In a food processor combine the all purpose flour, whole wheat flour, sugar and salt. Add butter and process for another 5 seconds. Add egg yolks and ¾ cup of cold water and process until dough is soft, a couple minutes. Line a baking sheet with parchment paper. Turn the dough onto a lightly floured surface and knead until smooth. Cover in plastic wrap and let it rest for 30 minutes in fridge before using. Preheat oven to 400 F degrees. Line a baking sheet with parchment paper. In a bowl pour vanilla extract over blueberries and toss. Add flour and sugar over blueberries and toss. Roll out the empanada dough so that it&apos;s about ⅛ of an inch in thickness, might be easier if you cut the dough in half first then work with each half separately. Cut the dough into 4 inch rounds, you can use a bowl or a big mug to cut into rounds. Alternately you could cut dough in 16 pieces and roll out each piece into a 4 inch round. Spoon about 1 tbsp of goat cheese onto each round, then a couple tbsp of prepared blueberries, onto the center of each round, then fold dough in half enclosing the filling. Press the edges together to seal, then crimp either with your fingers or a fork. Transfer empanadas to prepared baking sheet. There should be enough empanada dough for 16 empanadas. Brush each empanada with egg wash and using a fork poke holes into each empanada. 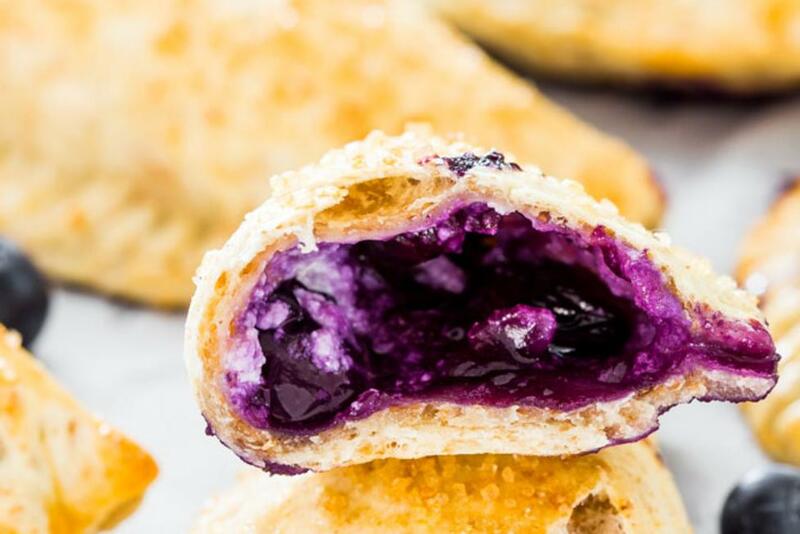 Sprinkle top of empanadas with a bit of Turbinado sugar.